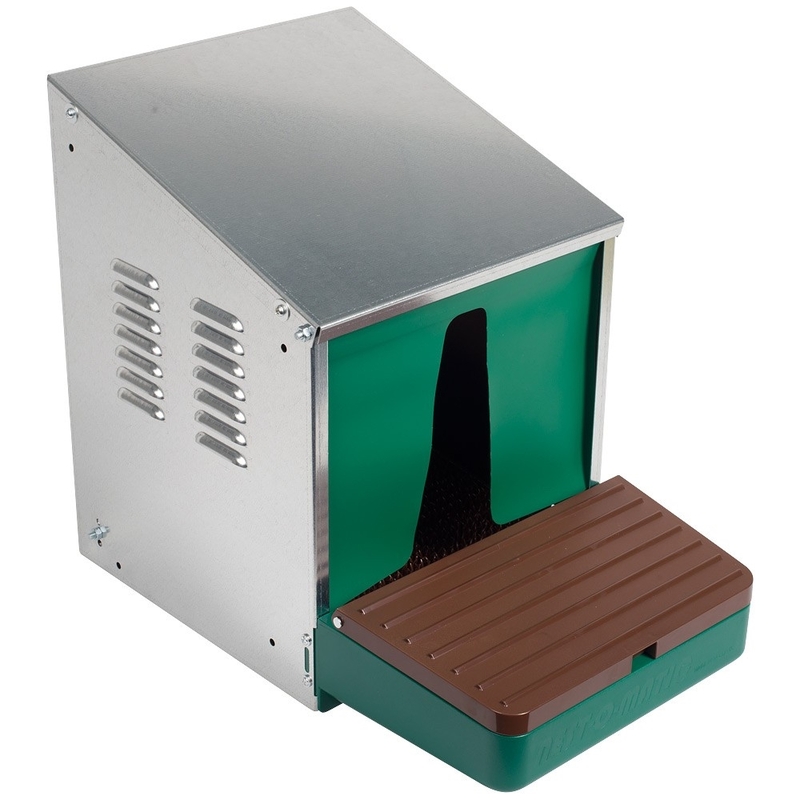 Nest-o-Matic automatic roll-a-way nesting box. Stop dirty eggs, Stop egg eaters, Stop broody hens, Stop red mite! 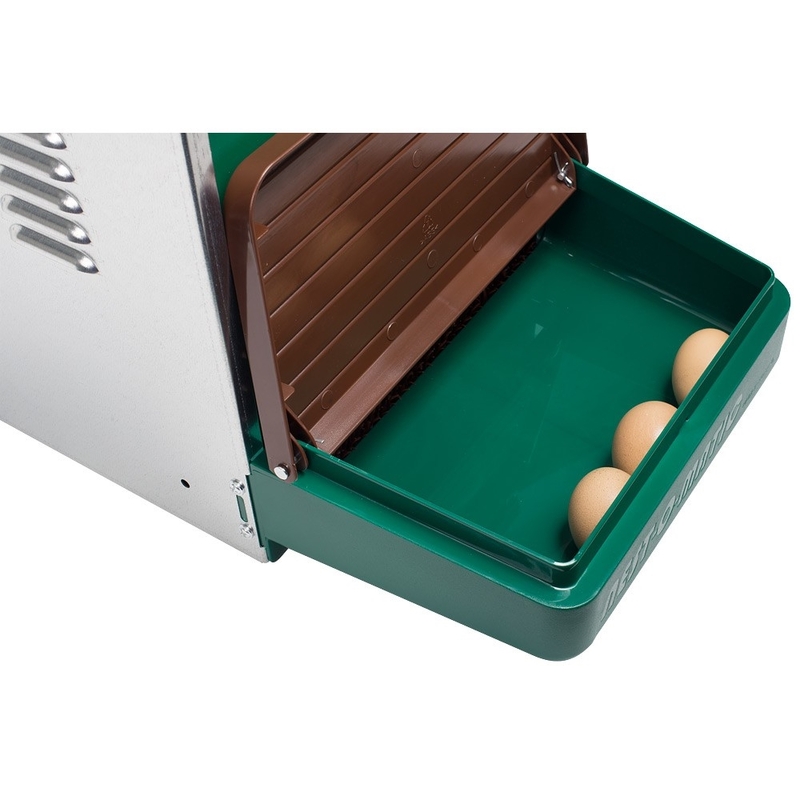 The Nest-o-Matic is a comfortable and sheltered place for your poultry to lay eggs. Eggs roll out by themselves into a covered tray preventing them from being destroyed by the hens, or dirtied. This system ensures that the all of your eggs can be collected quickly, easily and without hastle! Discourage broodiness in hens, as there are no eggs to sit on, hens will be less likely to go clucky. The roll out laying nest is supplied with a soft nest pad which is made of anti-bacterial polyethylene. The softness of the nest pad ensures a comfortable area for the hens to lay. As required, the pad simply lifts out to be washed, dried and returned to the nest for tomorrows eggs - thus keeping the nest clean, tidy and hygienic, giving your hens the ultimate comfort and with absolutely no hay, straw or shavings to bother with will reduce time spent cleaning your coop. You will be collecting clean fresh eggs every day, no more soiled eggs to wash, especially during the wetter months. The nest pad slopes down towards the collecting tray. The sloping floor can be set at three different angles where the eggs will naturally roll into the collecting tray where up to 12 eggs will be held at once. The tray base and lid is made of tough, long lasting ABS plastic. The lid of the collecting tray hinges and gives you easy access to the eggs. The curtain on the laying nest ensures the hens can lay eggs in a dark and sheltered area, giving your hen the privacy some coops lack, which can cause hens to seek other places to lay. The sloping roof of the Nest-o-Matic prevents the poultry from sitting on the laying nest thus keeping it tidy. Multiple Nest-o-Matic's can be attached to each other with the supplied mounting kit. This way you can connect several Nest-o-Matics to each other depending on your flock size! The Nest-o-Matic is made of durable material. The plastic parts are made of UV resistant and high quality ABS and the body is galvanised sheet metal with a minimum of 1 mm thick. Note: The Nest-o-matic laying nest is delivered unassembled as a flat pack kitset. Assembly is child’s play and will only take minutes to assemble. Once assembled the Nestomatic has the following dimensions : 48x31x42cm (L*B*H).